The University of Delaware’s Alfred Lerner College of Business and Economics recently honored some young future investors at the 2017 Stock Market Game awards reception. 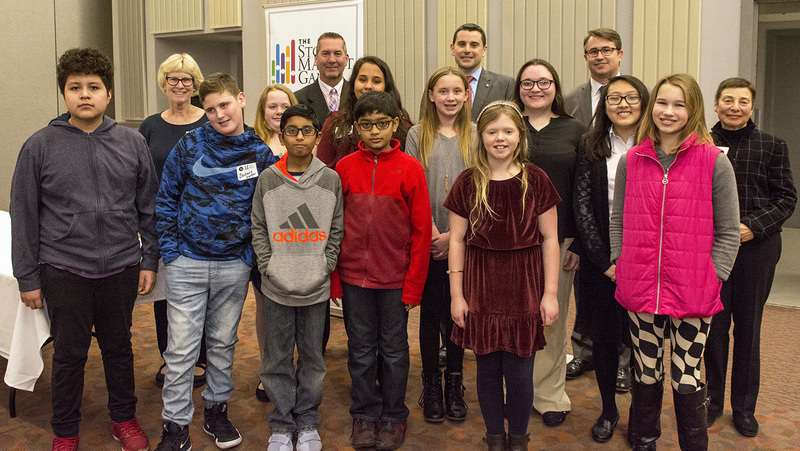 Lerner’s Center for Economic Education and Entrepreneurship (CEEE) recognized students in elementary, middle and high school who competed to see what financial returns they could post with a hypothetical investment portfolio focused on securities traded on the New York Stock Exchange and Nasdaq. The statewide competition, now in its 35th year, drew 1,486 students on 324 teams. The Investor Protection Unit of the Delaware Department of Justice (IPU) supports the competition. Gregory Strong, director of the IPU, stressed the game’s educational value at the awards reception. Each team received a virtual deposit of $100,000 to develop into a growing investment portfolio. Research was a critical component of the challenge: students investigated public companies and their stock performance before trading on the SMG website at real-time prices. Linden Hill Elementary took first place for the elementary school division, led by teacher Janet Huckleberry. Students Adarsh Ramamurthy and Varun Ravichandar realized returns in excess of 9 percent with a timely play in popular destinations for holiday shoppers. The Linden Hill team regrouped after a few missteps landed them in 80th place. Shares in Target performed well after the team sold its holdings. “And we didn’t know about broker fees,” grinned one student. The team, however, learned quickly from their mistakes. The secret to their success? “We bought from different sectors – not just tech stocks,” said one student, underscoring the importance of a diversified portfolio. Maclary Elementary garnered a second-place win, earning only $103 less than Linden Hill. With guidance from teacher Margaret McNutt, students Mia Carew, Megan Germack and Heidi Thompson grew their nest egg by 9 percent, ending with $109,170. The young women invested in diverse stocks including Celgene, GAP, Heinz, Skechers, TJX Companies and ULTA. A savvy decision to sell underperforming shares in UnderArmour rocketed the team from 46th place to first. As the competition closed, students checked headlines daily and avoided rash decisions that could have jeopardized their lead. “By the end of the game, we had 85.1 percent in stocks, 14.9 percent in cash, and $16K in our bank account,” reported one student. First place in the middle school division went to Gauger-Cobbs, led by teacher Kerry Waugh. Students Rownaiga Bockesha, Jonathan Reyes-Vera and Zachary Riley turned to reliable blue-chips – Google, Microsoft, Apple and Nike among them – that paid off with a healthy six-percent return. Holy Angels earned an outstanding achievement award in the elementary school division. Teacher Keith McKenica advised best friends Mariana Fernandez and Caroline Jefferson in a successful investment strategy. Favorite retail brands such as Urban Outfitters and Express led the team’s portfolio, which later expanded with investments in Bank of America and Starbucks. “We got to see our stocks grow, and I was with my best friend,” said one of the young women. First place in the high school division went to Newark Charter School. Guided by teacher Justin Miller, students Jessica Pak and Morgan Parker achieved a remarkable 17 percent return after an admittedly bumpy start. “In the beginning, we weren’t quite sure what we were doing,” one team member recalled. On their teacher’s advice, they invested in a few popular companies, including Google and Amazon. Upon concerns that their strategy was a bit conservative for the game’s 10-week window, Pak and Parker switched to a more aggressive stance – and quickly tumbled from seventh place to 18th. Undeterred, the young investors bought shares of Sage Therapeutics Inc., a volatile stock selling at its 52-week low. Within days, the risky trade skyrocketed, paying off in last-minute profits and a first-place finish. Awards were presented by Strong and his colleague, Craig Weldon, chief special investigator for the IPU. Strong praised the winning teams, and stressed the IPU’s enthusiasm and continued support for the program. Asarta closed the reception by thanking the teachers, mentors and parents who supported the winning teams. “The time that you spend teaching them about money is valuable, and demonstrates that you care about these kids and their education,” Asarta said.